After taking her first film, Maid of Honor, to the 1999 Sundance festival, director Jennifer Arnold was ready for her next challenge. She and a crew traveled the country in search of answers. The burning question: "The mullet -- why?" Who knew that a documentary devoted to examining the motivations behind the short-in-front, long-in-back hairdo (aka the "mudflap," the "shlong" and "hockey hair") could turn out to be so engrossing and entertaining. 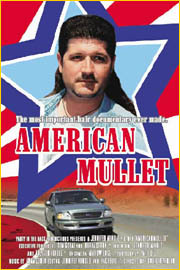 In interviews with mulletheads across the country, (who, by the way, come from different walks-of-life and communities), American Mullet manages to be hilarious without humiliating the proud bearers of the haircut. It debuted at the last IFP to great reviews.